JIF Marine 5 Step Wide Step Steel Dock Ladders, Blue Powder Coat Finish. Constructed from 1" Square Steel Tubing with 14 gauge galvanized steel steps. Distance to First Step: 8 3/4"
Assembly required - hardware included. 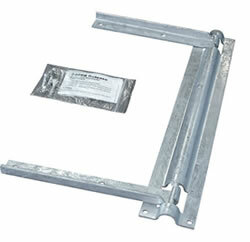 Ladder bracket allows for easier removal of ladder during bad weather or for winter storage. Also gives ladder flip-up functionality so ladder can swing out of water and rest on top of your dock. Made from galvanized steel for better resistance to rusting and corrosion. Comments: At first, I did not receive my ladder, I called the company and they said it had been returned by someone. They researched the issue and found it had been delivered to the wrong town with my address. They immediately took control of the complicated issue and sent me another ladder immediately. That was great customer service in my book and I would order order products from them in the future.